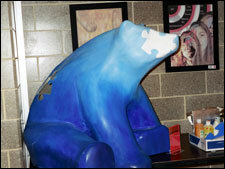 Students of the 2005 Arts Expo Committee created this Bear Fever puzzle bear for the TriCounty Area Chamber of Commerce showing off assorted artistic styles. Artie welcomes all members of the community to dine at The Grill Shop and to become an official Raccoon Member. Dues paying members enjoy many advantages and benefits in the community. Just ask Founding Fathers Paul Stahl, Brian McDonough, Barry Irey, and Pete Lawler for any information regarding this prestigious organization. And so, the Bear Fever Committee wanted to find the perfect artists for this VIP Bear Fever bear. Naturally, because the project focuses on student involvement and because the TriCounty Chamber consistently creates opportunities for career development, we wanted students to be the artists in charge. And what more perfect students than those involved in Boyertown High School’s annual Arts Expo. “Mrs. Stahl was tough to say “no” to since our first bear (Townie, one of BASH’s prototype bears) was so successful,” Debbie explained. “But I’m hopeful that others feel the same about our Arts Expo bear and that I can see success in Rachel’s eyes,” she added. Rachel loves to paint and enjoys the involvement with the community that Bear Fever has inspired. She hopes to add “Artie” to her portfolio to present to colleges when she applies. Debbie’s interests in art are matched by her interests in running, golf, gardening, shopping, and family. Her goals are to see something different everyday, make someone smile everyday, express her love for her children everyday, and help her students enjoy their art experiences at BASH. “Artie” features puzzle pieces fashioned in assorted artistic styles and seems a perfect theme for one arm of Bear Fever’s mission: promoting the arts—all kinds, all styles.